Using a free application on Facebook, you can insert a Paypal button that people can use to donate to your organization–right from Facebook! I’ll show you in the next post how to insert the button on your Facebook page. 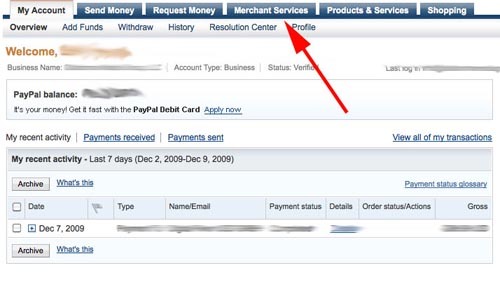 First I’ll show you how to create the button in your Paypal account. The only thing this tutorial assumes is that you have a Paypal account already set up. 2.Next, click on the “Donate” link under the Create Buttons header. 3. Here’s where you add the specifics about your button. It’s already going to be tied to your paypal account, so don’t worry about having to put in an email address or anything. Since you selected a “donation” button, that is already filled in for you in the first field. Type in the name of your organization. This will display on your checkout page, where the user enters their credit card info, and it will also show up on their Paypal and credit card statement–so be sure it matches the actual name of your organization or somehow accurately identifies who will be billing the customer. Don’t worry abut entering a Donation ID. In most cases, this won’t be necessary. If you want to customize the appearance of your button, click on that link. 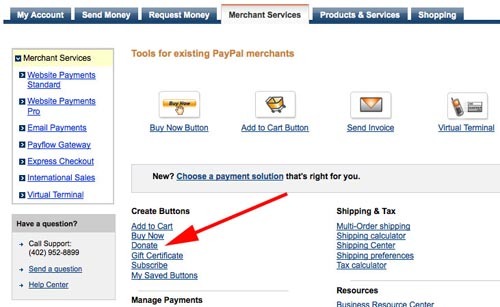 This would be if you wanted to import your own HTML for the button, or select a different default Paypal button. For most cases, you can just ignore this as well and leave the button as it is. Select your currency type (most likelyUSD) and whether you want donors to input their own donation amount. Select “secure merchant account ID” and hit “create button.” You can edit those advanced settings if you wish, but there is no need to for a basic button. 4. 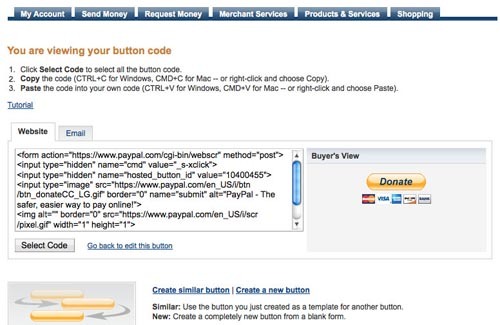 Paypal automatically creates the HTML code for your button. It’s all ready to go–all you have to do is cut and paste! So go ahead and copy and paste this code and save it somewhere, like in a text file or something. This is the code you’ll need to paste into the app on your Facebook page; I’ll show you how to do that in my next post. You can also choose to save this button, if you want to save it in your Paypal account, if you’re going to use it again later or need to access it later for any reason. 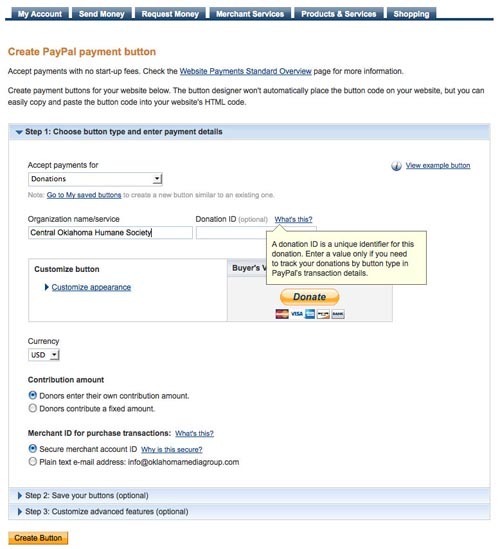 Kiya–check here for that information about putting a paypal button your Facebook page.